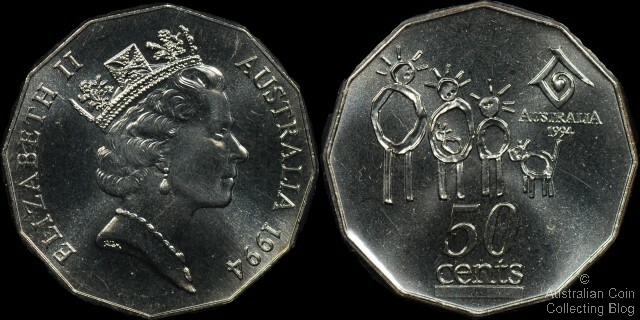 In 1994 the Royal Australian Mint released the Year of the Family 50 cent coin into circulation (see image above). It has been noted that the there are two varieties of this coin. The spacing between the first two numerals (1 and 9) and the following two (9 and 4) in the date can vary resulting in the wide-date and the narrow date-varieties. When one of each variety is available for comparison the difference is quite obvious. However, when just one coin is available it can be more difficult. If you have a coin in isolation then the following method has been proposed to determine which variety you have. Draw a line through (and parallel) to the bottom cross bar of the four in the date and project it left until it intersects with the 1 in the date. Observe whether the line passes through the same level as the bottom of the loop in the first or second 9 in the date. If level with the bottom of the loop in the first 9 then the coin is the wide date variety. If level with the bottom of the loop in the second 9 then the coin is narrow date variety. See the image below for this method in use. 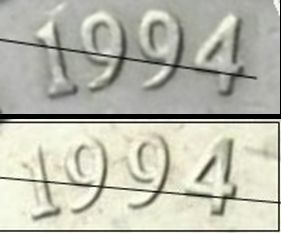 The narrow date is the top image and the wide date the bottom.